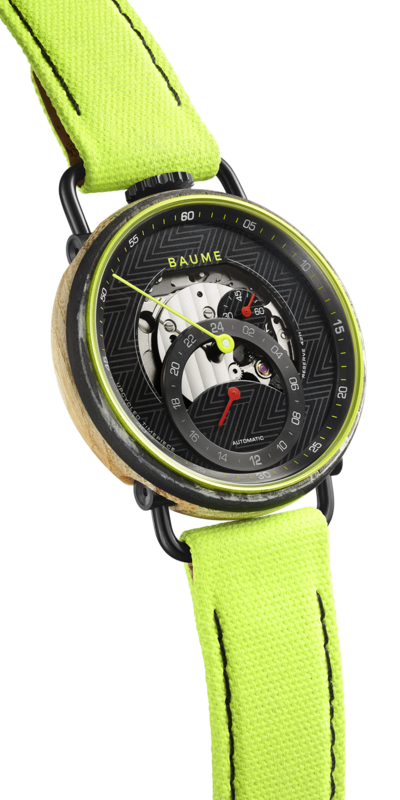 Baume Watches Limited Edition Automatic ZAG watch. Recently, Baume Watches — the watch brand launched by the Richemont Group last spring that is founded on the principles of sustainability –partnered with French ski brand Zag to create a limited-edition watch that retails for approximately $1,350. It is the second limited-edition watch by the brand; the first was a series launched with skater Erik Ellington and his HRS brand. Both companies have adopted sustainable practices, and are challenging the status quo to shift mindsets — encouraging people to consider the environmental impact of certain materials. Both brands are dedicated to using up-cycled materials, as well. The new 42mm Baume and Zag automatic watch (Miyota movement) is built using excess materials from the production of ZAG professional skis. The case is made of two materials: natural wood and carbon. A yellow anodized aluminium container surrounds the movement and is clipped onto the casing to protect from any external damage. The layers of the case are pressure treated using epoxy resin to strengthen the wood. “The processing and finishing of the cases is completed in Switzerland using a combination of traditional man operated processes and digital machines,” explains Baume. Caseback of the Baume Watches Limited Edition Automatic ZAG watch. 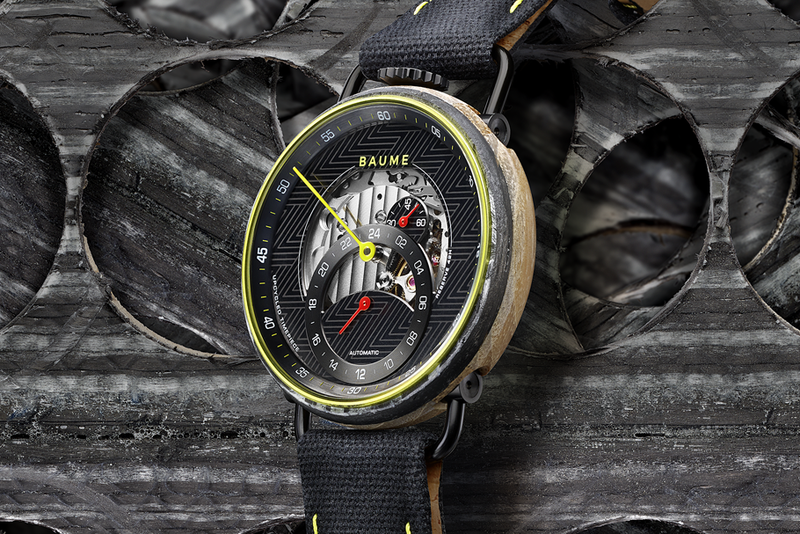 The Baume x Zag Limited Edition watch is sold with with two interchangeable straps: a black version with cork lining with natural and yellow stitching, and a yellow version with black cork lining and black stitching. The yarn in the bracelets were made from recycled PET, sourced from plastic bottles fished from the oceans by Waste Free Oceans (WFO), a partner of Baume. Just 100 pieces of the watch will be made. 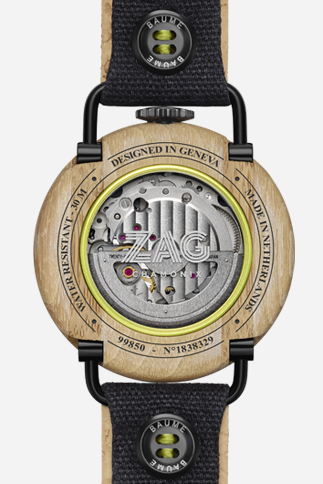 The BAUME x ZAG Limited Edition watch will be available exclusively on www.baumewatches.com and in Val d’Isère, the only ski resort in the world with the Green Globe label for its commitment to sustainability and social responsibility. Additionally, Baume and Zag have developed a special pair of skis: the Zag x Baume H-95. Used by the ski patrollers of the Mont-Blanc Valley, the Zag x Baume H-95 features a flat end with a powerful light rear rocker, and a long progressive forward rocker that allow the skis to be used on all different types of mountain terrain.